The merger of UMIST and Manchester University created Britain’s largest unitary university. Both universities had previously promoted their comprehensive conference and meeting facilities to a wide audience and there was an urgent need to pull this together into one suite of material. We developed a style which would capture the imagination of conference organisers with a new fresh and contemporary design, focused on the University’s stunning buildings and huge range of different style venues. All essential information was presented in a clear and easy to access style. 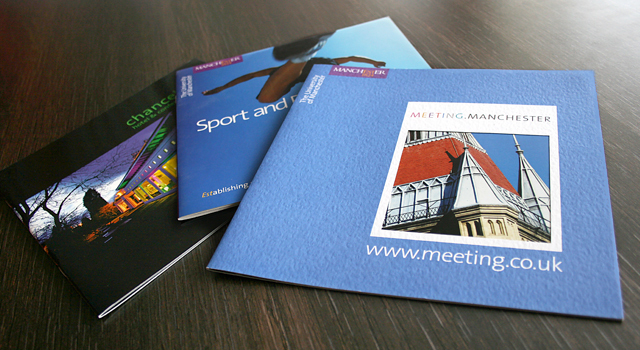 The use of foldout spreads ensured all vital information on venues and facilities was available at a glance. We developed an interactive e-brochure for the Universities conference facilities. As a piece of brochureware it is built using predominantly flash and xhtml and is designed to provide easy access to a series of downloadable mini pdf brochures.